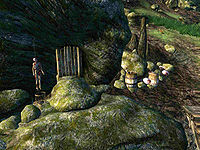 Bloodrun Cave is a small cave far east of Bravil containing necromancers. It contains only one zone, Bloodrun Cave. This cave contains 15 Cairn Bolete plants and 1 Wisp Stalk plant. This location's map marker (M on map) is named Bloodrun Cave (editor name BloodRunCaveMapMarker). The entrance door is SE of the marker, 30 feet away. Outside the cave are a set of wooden stairs, if you follow them down you will find a bloody Zombie corpse and 2 animal enemies. In the river just under the end of the stairs is a large rock with two Skeleton corpses. The exterior of this cave offers some clues as to the profession of the inhabitants: apart from the corpse on the stairs you will find another one strung up the in front of the entrance door and a barrel nearby contains some chopped up body parts. In this level you immediately start at an intersection, both routes will take you to the final boss chamber so it is advisable to use one for the first journey and the other for when you have to backtrack to the entrance. Head west and fight your way through the rooms; the second room you enter contains a Zombie corpse, a table and a bedroll (b). 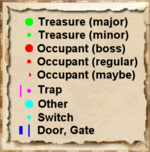 After that you can either go left, into a room with one enemy and rejoin the other passage or continue straight into another room with another enemy and a minor loot chest. The final chamber is where the Boss-level Necromancer (A) and chest (B) are located. You arrive on a ledge higher up than the level of the room where the Boss is. From up here it is possible to take a good sneak shot at the Boss and you can either stay up here or descend and fight the Necromancer in melee. Note that there are two Skeleton Archers on the ledge opposite yours which could target you if you venture down. 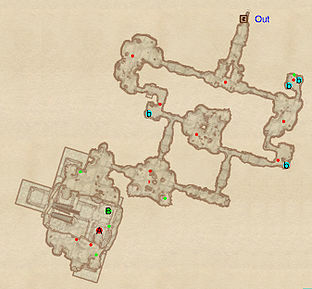 Backtrack to the entrance using the second route where you will find enemies and two rooms with three bedrolls (b) in total.